So before chaos comes a-calling we like to plan plan and plan. Each year we brainstorm ideas to help fill our days with over the Summer and beyond. Here in Scotland we can’t guarantee sunshine on our summer hiatus from school so the activities we come up with have to cover a wide range of weather and circumstances. We start with writing down categories such as crafts, days out, nature activities or gardening then writing down our favourite activities from the last few years and then scour , books and Facebook for new ideas to try. So to give you a head start I thought I’d share with you the list my family and mindees have come up with for out summer bucket list this year. So you can benefit from out planning and avoid the panic. Make a bug spotter sheet and search for bugs. Press some flowers – we’re pressing some to turn into a beautiful picture in the longest day.. you could also make a bookmark, table mat, or a card for someone special. Build a butterfly feeding station. Make a rainbow garden. Sow some annual flower seeds in bands to make a flower power rainbow. Try spotting the international space station. Have water fight. These water guns are fantastic. They hold a decent amount of water so refilling isn’t constant. The pump action is a little tricky for little hands though so many keep this for kids 5+. Make a flower garland or curtain. Grow edible flowers to decorate your plate. Design an obstacle course for your kids and their friends. Have medals or stickers to give to the winner. Nature treasure hunt/ colour hunt. Recycle some soda bottle plastic by making beautiful butterflies for the garden. Make a video diary for a relative or friend. Design a bird bath for your feathered friends. Stargaze at night. Try to plot a constellation. Tag. Take some flash lights and play torch tag. You could use glow stick bands too. Design your own stepping stone. Collect shells at the beach and paint a funny character. Have a beach BBQ and toast marshmallows. Visit the beach and help the environment by having a litter pick up or fill a jar with Nurdles. The little plastic beads that are filling our oceans. Use some bamboo canes, netting and pruning to make a camouflaged bird spotting den. Need To Get your Summer Organised With Some Planning Sheets?? Use black card and some glue and catch a spider web. Have a picnic under a tree, explore the tree and find out what’s living there. Let the kids make a scavenger hunt together for a familiar park or area. Paint a stone hide a stone find a stone. There are special groups almost everywhere now where you find a pebble and paint on a picture of your choosing and hide it somewhere outdoors. Make a sling shot with a strong forked stick and a chunky rubber band. Place some balls or other light objects on loo roll tubes as targets. Never aim at people or animals! Go to a 5 a side pitch and play ball. Right there you go! 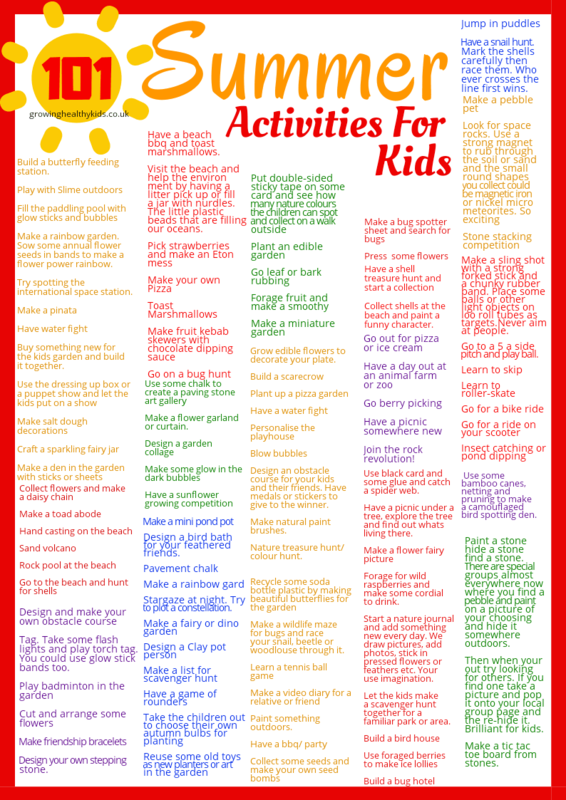 A giant list of activities to keep the whole family amused this Summer. Let us know which ones you enjoy!! And don’t forget to pin this for later!!! Well, this articled covered almost everything. A well-thought post. To add to it, a treasure hunt can also be a great idea. It is a group activity, and most of the treasure hunt sets that are available in the market allow both indoor and outdoor setup. Kids also become more social and will learn the value of teamwork. On top of that, a Treasure hunt is one of those few games, that gives you a chance to push your brain and come up with a solution, which is good not only for kids but adults as well.